I have this sticker that is on the back window of my truck. 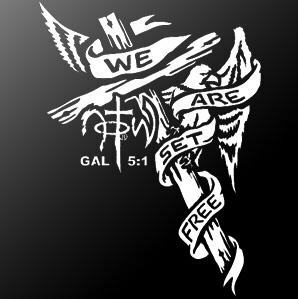 It is the image of the Cross with the words “We are set free.” This comes of Galatians 5:1 where Paul tells us that Christ has truly set us free. Many may wonder what it means to be truly set free. What are set free from? Paul stated that we are set from the law that enslaved the Israelites. While working out this morning, I was watching a program with a gentleman named Joseph Prince. I had never watched him before, but got caught up in what he was teaching. He took us back to the time at Mt. Sinai when God laid out the 10 Commandments to Moses. Prior to that point, God would come meet with people Abraham, Isaac, and others face to face. When the Israelites began Exodus, they would often grumble to Moses and God would show grace by parting the Red Sea, raining Manna, bringing water from a rock. At Mt. Sinai, however, it all changed and when the elders of Israel said they would do all God commanded, the laws were handed down and they became slaves of the law. For the next 1,500 or so years, we see time after time where people turned from God and then would repent and obey God’s law. The focus, was more on keeping the commandments rather than on faith in God and loving Him. Fast Forward now to Jesus. When Jesus was asked about which Commandment was the greatest, he said that we are to love the Lord our God with all our heart, all our soul, and all our mind. True faith and love for God had been lost up to that point for most. People were bent on keeping the law that they lost site of what it meant to be truly faithful. Through Jesus Christ, we are shown God’s grace and love. God became flesh and willingly gave his life to die for us and take the punishment of sin that we all deserved. That is grace and love. Through this willful sacrifice, we were set free. Free from sin, free from death when Christ rose from the dead. Jesus’s first coming was in Grace. Grace to set us free and to be given an open door to once again be able to know God and learn what true faith is and what true unfailing love is. Through full faith and trust in Christ, we are free. We are free to love God with all that we are. We are free to live for God’s purpose and His will for our lives. We are free to live. Jesus is Life! It’s a great feeling to know what the Grace bought through Christ’s redeeming blood has brought us. Even when we are not deserving, we have the intercession of Christ. Just as God continued to show Grace to the Israelites through their grumblings in the wilderness before Mt. Sinai, His Grace was again returned to us through Christ even through our fallen state and no matter how much we have jacked up our own lives. I am just as jacked up as the rest, but know that through repentance and faith in Christ I am redeemed and free from that sin. We are free to live and we are free to love! This entry was posted in 4 Stream Blog, Walking with God and tagged 4 Pillars, faith, God's Purpose, Jesus Christ on May 20, 2014 by Richard Clinton.